Can you imagine a time when you really wanted something….when every time you thought you were going to get it, then, only to be told NO. After a while you did not believe it would happen… after a while you did not trust… after a while you did not believe good things could happen. Without a photo ID, persons who are homeless often find they cannot successfully move out of homelessness and move toward self-sufficiency. The very lack of ID exacerbates and perpetuates their homelessness. They cannot get lawful employment. Often, basic social services and public benefits can be delayed. It is therefore critical that homeless people are able to obtain identification. Over the past year, Mercer Alliance has helped over 100 individuals get ID through the Project Homeless Connect (PHC) events. These individuals now have overcome a major barrier in obtaining opportunities for housing, needed services, employment, and admissions to hospitals and the Henry J. Austin Health Center. Some of our homeless Mercer County citizens are in need of very basic photo identification. Since the 9/11/01 tragedy the federal government has instituted very strict requirements to apply for government ID. There is a maze of requirements to navigate at the different agencies in order to have all the right documents to receive the photo identification card. Federal, State, County and cities may have different rules and request different documents. It is a very frustrating progress, and even if one can navigate the system, many of our homeless cannot afford to purchase the government issued ID. A person has to pay either $10 (Trenton Birth Certificates) or $25 (NJ Birth Certificates for places outside Trenton), and $20 for a Mercer County Photo ID. How does The Mercer Alliance ID Project Work? 1. Homeless individuals lacking ID sign-up at one of our bi-annual Project Homeless Connect Events. 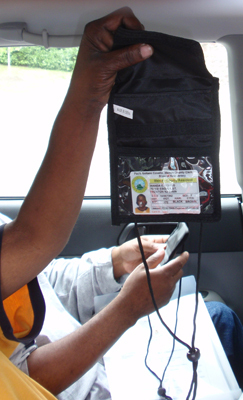 The participants schedule themselves for one of six days set aside for the actual process of obtaining ID. 2. All individuals meet at the Salvation Army Drop-In Center. As we start the day, there is a general feeling of disbelief among everyone. They do not trust that something good can happen. After preparing the various applications and reviewing their individual packets, our identification seekers load onto the van. We visit the Board of Elections, Mercer County (Voter Registration Cards), the City of Trenton Office of Vital Statistics (Trenton Birth Certificates), New Jersey Bureau of Vital Statistics (NJ Birth Certificates for places outside Trenton), and finally the County Clerk’s Office (County Photo ID). 3. The staff at each location are friendly, very helpful, compassionate, and professional. As applicants receive their Birth Certificates, we start to see some hope in their faces, as if the impossible can indeed be accomplished. And when they are actually sitting to have their photo taken for the County ID, the eyes start to twinkle and smiles abound. 4. After receiving the ID, individuals have proof of mailing (Voter Registration Card is considered a piece of First Class Mail), an important proof of citizenship and ID (Birth Certificate), and a piece of government issued Photo ID (the Mercer County Photo ID). The look of gratitude on their faces is amazing. Several people had a job interview coming up and/or an open job offer but needed the photo ID in order to proceed. Ken had a job offer outstanding that required photo ID and was in danger of losing the opportunity. Mercer Alliance was able to help Ken before the employment opportunity was lost. Johnny was actively seeking opportunities and had several interviews lined-up. He was informed that photo ID would be required. He now has photo ID and is pursuing employment opportunities in full force. Still others needed a Birth Certificate and photo ID to obtain permanent housing. And a few needed the ID in order to take advantage of the Henry J. Austin Health Center. Helping the homeless remove an obstacle to success is what this effort is all about. We appreciate the support of the many individuals who contributed to remove these obstacles and restore hope.